Yesterday I found myself running through some of the slides for our up-and-coming sales kick-off. The theme this year relates to moving sales people to the brave new world where 56% of buyer research is done without any salesperson interaction. 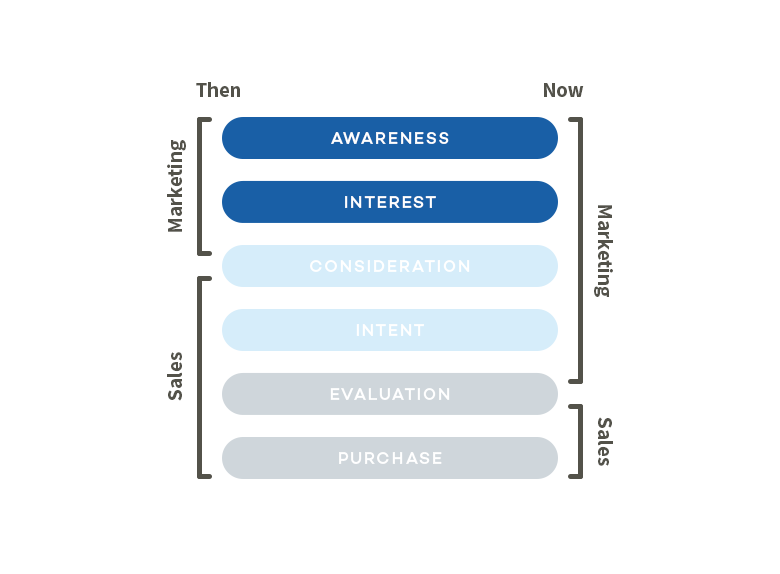 Looking at a then and now scenario, it’s clear that in the past responsibilities for the end–to-end sales cycle were shared relatively evenly between sales and marketing. Today, the approach needs to be different and marketing is considerably more involved in the end-to-end process. As I was talking through this graphic it occurred to me that the smart salespeople in the room would contemplate the information presented and realise a startling truth; if an organisation was resourced based on the ratios presented we would need over 100 marketing people to create the content and manage the influencing process prior to a buyer even interacting with the business. Here’s the question: even though we have clearly defined sales roles and marketing roles that support yesterday’s buying processes, how does the organisation adapt to support the new approach? One idea is to ‘chunk down’ the two roles into individual job tasks and re-assign them to the new way of doing things. What do I mean by this? Yesteryear, as a salesperson, I was expected to consult my little black book, align the products I had in my toolkit to a target list and pick up the phone or go and bang on doors. Today’s salesperson needs to build his own brand; he or she needs to be seen as knowledgeable about specific subjects and have the ability to target his or her audience through social media, not necessarily advising but providing information that will help the buyer on their journey. In the past, the marketing department provided this information, so where does it leave us today? In this brave new world my salespeople need to spend a proportion of their time working out how they are going to influence their market. They will do this through becoming an expert in their field, by creating content, posting on social media, managing their online profile: their brand. But wait, brand management is a marketing function, I hear you cry. Not anymore. Brand management and, in particular, your own personal brand, is your responsibility. Today’s salesperson needs to stop saying that it is the role of the marketing organisation to warm the market. They need to embrace the idea of building their own personal brand, of creating the content their buyers want to consume, of becoming the perceived expert in their field. Today’s salespeople need to be creating the profile and content that helps their target community take the journey from awareness to intent. This means a significant shift in the traditional sales role to one that has greater focus on marketing and brand management. Perhaps the answer is just having one role? An all-encompassing sales and marketing role, and within that role have sub-roles that support the many tasks or functions that are now required of a sales and marketing organisation.